Will Newly Planted Plants Survive a Cold Spell? With a couple of inches of snow falling and temperatures consistently under 35 the past few days, I’ve been contemplating this question: Will my plants survive? All of my established perennials, trees and shrubs will shrug off this little October blast of Arctic air as a mild inconvenience, of course, but we put in about 20 brand new shrubs and perennials the week before this current cold spell started. Those plants have not had time to send out new roots yet, although we were lucky to get lots of rain — more than 4 inches over several days, according to my rain gauge. So, I’ve been wondering, will my plants survive? 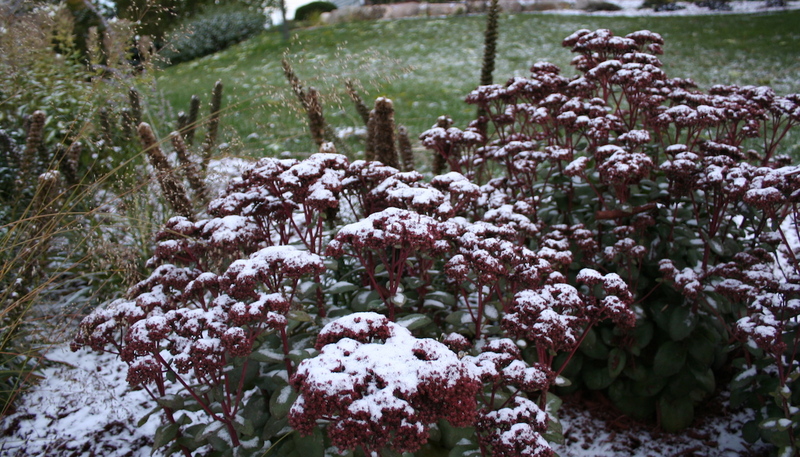 A dusting of snow, even in October, won’t harm established perennials. A check of Internet resources proved unhelpful since snow and cold this early is rare even here in Minnesota. So, I talked with the folks from the nursery where I purchased the plants. It turns out these plants likely would have been outside at the nursery anyway, and they should get through the cold just fine. We are expected to return to more seasonable temperatures by the end of the week, and that will give the plants a chance to send out roots and establish themselves. Whew! Quite correct! If you have not mulched the plants in with 2 – 3 inches of either grass clippings or tree bark mulch you may want to. It will help insulate the soil and hold temperatures more consistent for root development. Thanks for checking in, Jeff. We’ve got about three inches of tree bark mulch down, so things should be OK.